The aerospace industry requires components built to the most precise dimensions which will be as strong and as light as possible. Composite materials ( "fibre-glass" ) can be poured into a mould and then cured using a particular temperature profile to set them into light yet strong parts. Raven's Point has developed cure contol software which drives the heating process of composite material moulds, monitoring and adjusting in real time the temperature applied at every point of the mould, logging and analysing the cure process to ensure that it meets every requirement. A program to input the data from temperature sensors in an oven load, and check each part against the specified cure process. Very large parts cannot be placed in an oven. Each mould must be built including heating elements. 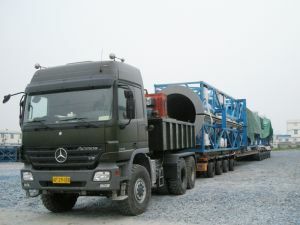 Photo shows wind turbine blade mould being delivered in China. This mould contains over 100 individual heating elements. Raven's Point software controls and monitors in real time the heating elements, ensuring that every section of the blade receives the correct cure. PHOTO COPYRIGHT: SUZHOU RED MAPLE WIND BLADE MOULD CO.